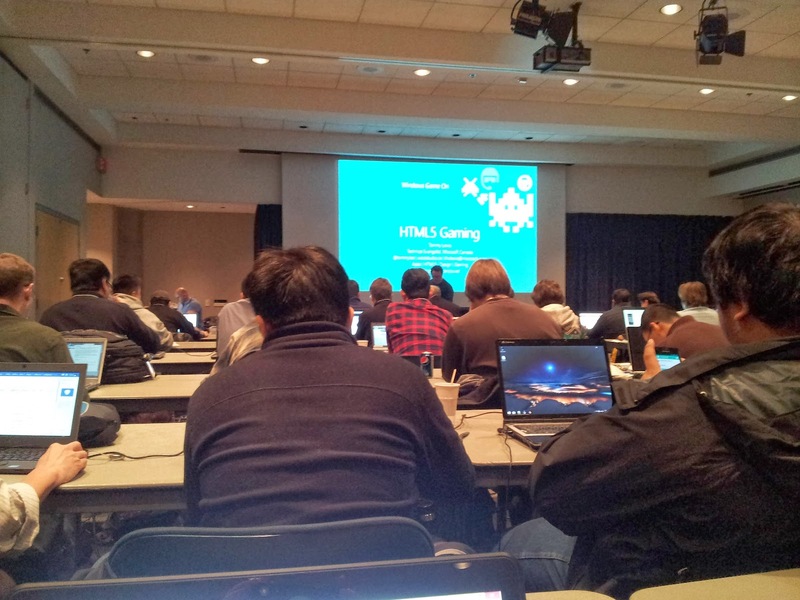 On Saturday, December 7th, 2013, I attended an all day workshop to learn about creating Windows Phone apps. 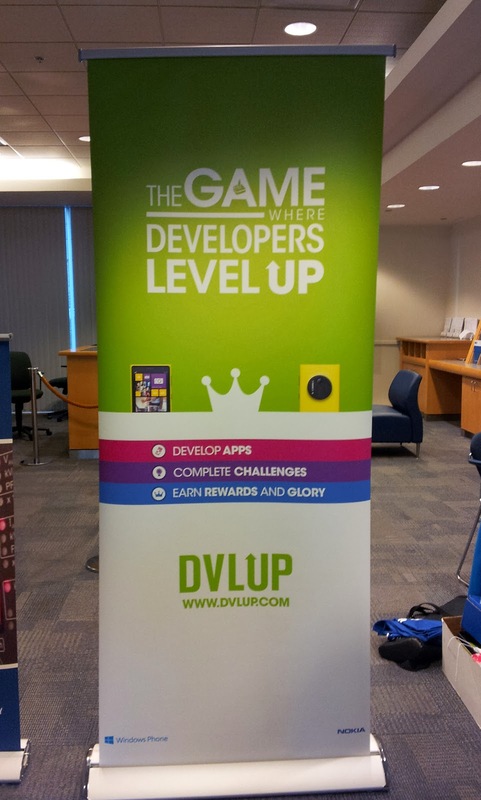 The workshop was held by Nokia and Microsoft at the downtown BCIT campus, to promote the DVLUP Windows developer awards program. 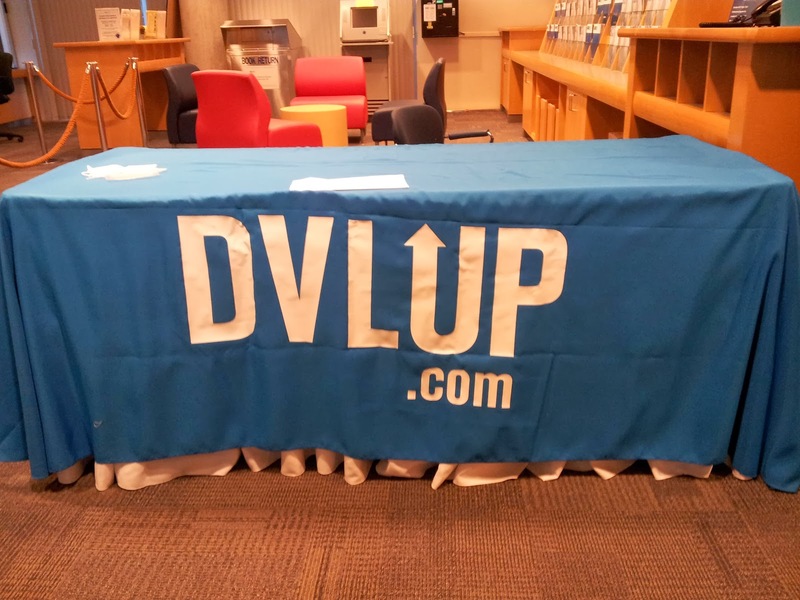 Developers can sign up at DVLUP.com and be rewarded for creating apps that fulfill the requirements of the posted challenges. Those that attended the workshop were given two weeks to submit or update an app, get it approved and published on the Windows Phone 8 Store in order to receive a Nokia Windows 8 Development Phone. Not a lot of time but thankfully, Microsoft came up with a easy way to create apps - even for those who don't know how to code! Windows Phone App Studio - http://apps.windowsstore.com - is a free online tool to create Windows Phone apps in minutes! They have templates that anyone can use to generate their first app. All you need is to provide the content. You can even download the source code and tinker around with it to make it more to your liking. Haha, having been obsessed with the movie Frozen, I created a Frozen movie guide app after a tried making an app for this blog kinda failed. I'm sure if I dig through some of the code, I'd be able to fix the problems but for the challenge, I had to be quick and submit it immediately, since the approval process can take up to a week and if the app doesn't pass the approval process, I'll have to fix it and resubmit which will take another week - time that I may not have. 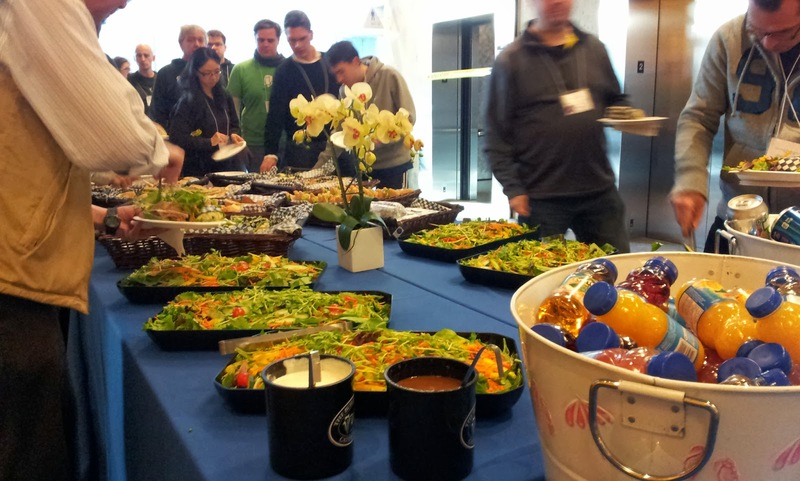 Since this was an all day workshop, Nokia was nice enough to provide us breakfast, lunch, dinner AND snacks in between to fuel brain and our fingers. 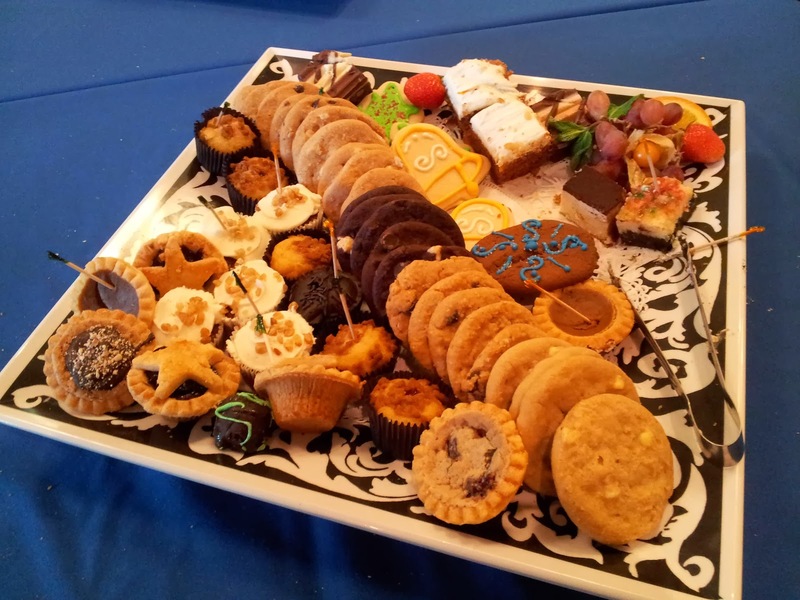 Developers love to snack, you know. 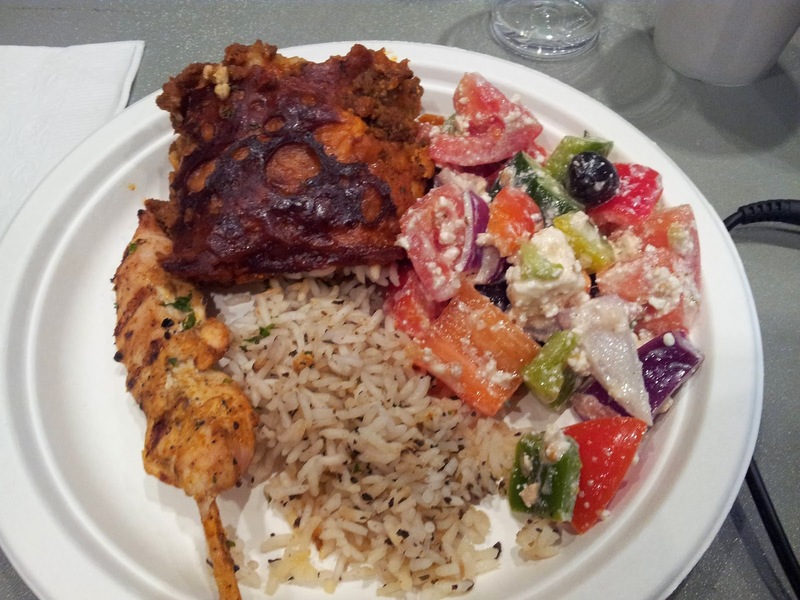 I learned a whole lot about Windows 8 development, the Windows App Store and how to monetize your app. Apparently, there is a large market for the Windows phone. It's not as popular here in North America but it is popular overseas or in South America. So there is a market for apps there; it is probably is easier to produce a money making app on the Windows app store than in the saturated iOS or Android store! I'm pleased to report that my app did get approved but...I should update it because it is not very nice as it is now. Drop in on one of our Area One parties to play Xbox One. 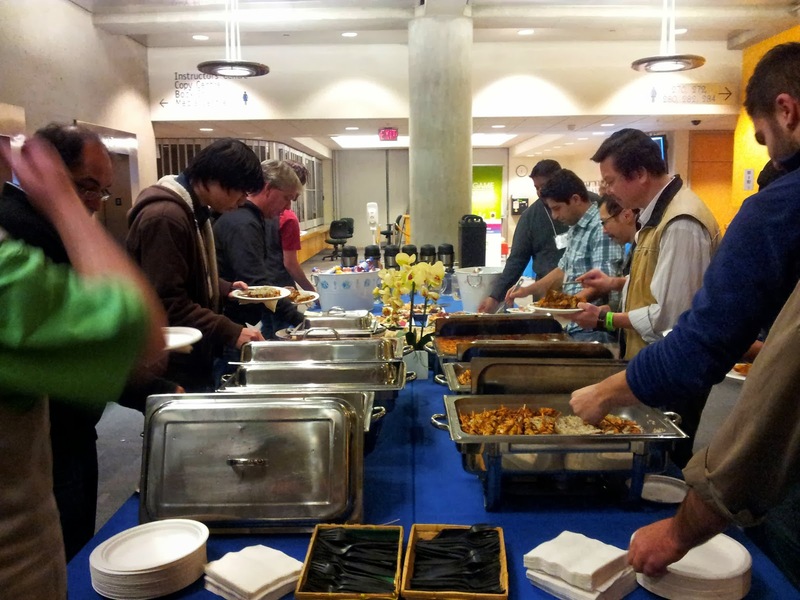 Space is limited for Area One events, entry is on a first come first served basis. If the venue is full you may be asked to return at a later time or different day. Must be at least 18 years of age to enter unless accompanied by parent or guardian. Don’t miss the official launch of the 2013 holiday season with live music and sweet treats at the 2013 Vancouver Tree Lighting Celebration. During the holiday season, Stanley Park sparkles with two million twinkling lights, decorating the darkness that comes early at this time of year. Make the Bright Nights Train part of your holiday tradition Ride the train, watch animated displays, listen to holiday classics, sip warm cocoa, and feast on fresh popcorn or roasted nuts. Enjoy the sight of young eyes dazzled by the display of lights and the excitement of the holidays. Partial proceeds from the sale of Bright Nights tickets go to the BC Professional Fire Fighters' Burn Fund. Adult $11, Matinee $6. Entrance to the plaza is by donation (you don't need to purchase train tickets to see the lights). Donations will be accepted at the front gate. We suggest a $4 minimum donation. Thank you! Join us at the Annual Kensington Holiday Craft Fair, Saturday December 7, 2012, from 10:00am-4:00pm. Public Admission to the event is free. Hand crafted items, doors prizes and food. More than 50 craft vendors offering unique hand-made items perfect for gift giving. Admission Free. Local artisans from the Renfrew-Collingwood area will be showcasing handmade crafts and special entertainment by the Windermere Vocal Ensemble, Van Tech music group, and Community Choir. The Red Sunset dance group will also grace the stage, and a lively puppet show will bring holiday cheer. Enjoy Chinese calligraphy, crochet and weaving by local artisan's demonstrations & paper craft-making. Raffle draw for a chance to win an original gingerbread house and food baskets prizes! Vancouver’s Favourite Artisan/Craft Fair is back for its final show of 2013 this December 7th & 8th! Shop from a wide variety of local goods ranging from Fashion, Jewelry, Accessories, Art, Sweets, Baby & Kids items, and more.Be one of the first 25 people each day to receive a FREE swag bag filled with goodies from our wonderful vendors and sponsors! Come Share in the Holiday Spirit Saturday Dec 7th, 2013 4:30pm - 8:00pm The Lower Lonsdale Business Association in partnership with the City of North Vancouver invites you to celebrate their annual Christmas Festival on Saturday, December 7, 2013 at The Shipyards located at the foot of Lonsdale Avenue from 4:30pm – 8:00pm. Stilt walkers, a gingerbread cookie character, a Christmas fairy and the inviting sounds of Christmas carolers will welcome you as you arrive on-site. Stage entertainment gets underway at 4:30pm with performances with a Christmas Elf Show; followed by the official lighting of the City of North Vancouver Christmas tree then the arrival of the Big Guy in the red suit around 5:30pm. Children are welcome to visit Santa at his workshop. Come down to Canada Place from December 1 – 31, 2013 to experience the 26th annual Christmas at Canada Place. Along our outdoor promenade and throughout the city, Canada Place is bringing you and your family the best in Christmas cheer this holiday season. From November 28, 2013 - December 27, 2013, guests of the hotel can enjoy a walk through Gingerbread Lane, which features over 40 gingerbread houses that have been created by various partners. Opening day! The Vancouver Christmas Market is back for its fourth year from November 22 to December 24, 2013 on the Queen Elizabeth Theatre Plaza! Enjoy our expanded offerings of delicious food items and find unique Christmas gifts for everyone on your list. We'll have seasonal music to set the mood and a great entertainment program of authentic folk groups. Frozen is my new favourite movie! Disney's latest animated film blew me away with the stunning animation, beautiful heartfelt story and epic songs. Frozen is very loosely adapted from Hans Christian Andersen's fairytale, The Snow Queen. It features not one but two new princesses: Elsa, voiced by Idina Menzel and her younger sister, Anna, voiced by Kristen Bell. Elsa has the power to create ice and snow; a beautiful but also dangerous ability. After accidentally hurting Anna with her powers, Elsa is forced to hide them from her sister and the kingdom of Arendelle. However, on her coronation day, her powers that she strove all her life to conceal are revealed to everyone. She runs away in fear but not before accidentally freezes the kingdom in an eternal winter. Anna goes in search of her sister in order to bring back summer. Along the way she teams up with mountain man, Kristoff (voiced by Jonathan Groff) and his reindeer, Sven, as well as an endearing snowman, Olaf (voiced by Josh Gad). when it comes out in March! My favourite character is Elsa. I wish the movie devoted more time to her. She's such a tragic character. Anyone who has felt like they needed to hide their true selves from the world can relate to her. I loved the scene where she let's down her hair and finally transforms into the snow queen. She has such beautiful hair. The movie is playing 3D but except for the short "Get a Horse" that played prior to the movie, which wonderfully blended 3D and old school 2D animation together, the 3D was barely noticeable in the movie. So I'd recommend just sticking with a regular ticket. Also make sure to stay until the end of the credits! There's an cute extra scene at the end! I ordered the deluxe edition of the soundtrack shortly after watching the movie and I was so excited today when it finally arrived! Needless to say, I had it on repeat for the entire day. I'm still listening to it! 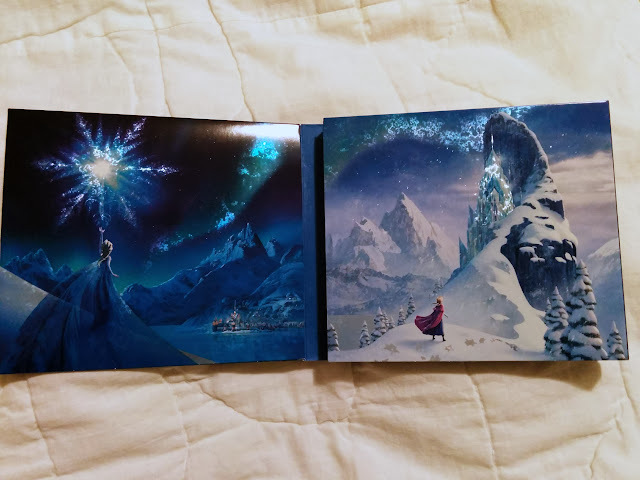 The inside cover has beautiful illustrations of Elsa and Anna in the beautiful Nordic landscape. 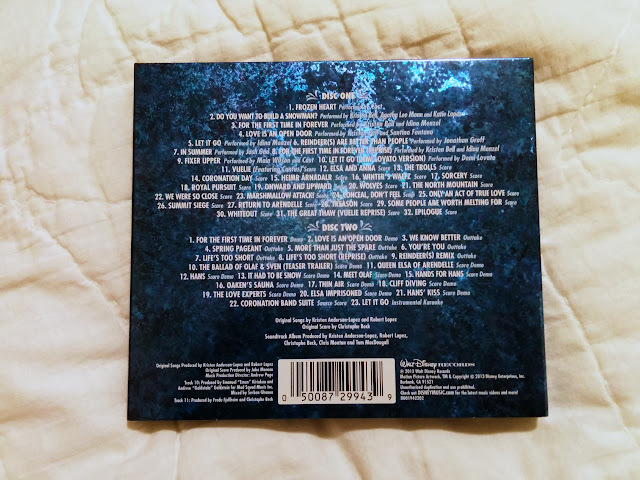 The first CD contains 32 tracks, 10 of which are songs, the rest is the score. 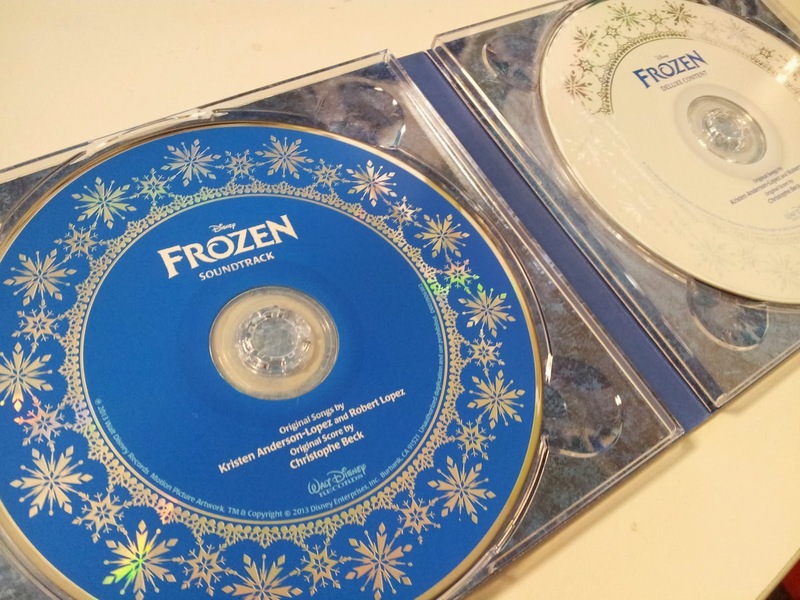 The second CD contains demo tracks as well as songs that didn't make it into the final movie. They are sung by the husband & wife duo composers Kristen Anderson-Lopez and Robert Lopez and their children. The soundtrack also comes with a little booklet which contains the lyrics of the 10 songs. 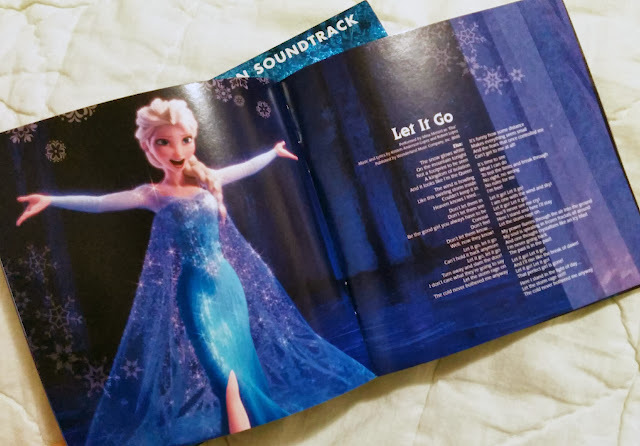 9 songs were in the movie, plus Demi Lavato's version of "Let It Go" from the credits. I love the super cute "Do You Want to Build a Snowman?" sung by Anna while she's growing up. And "For the First Time in Forever" also sung by Kristen Bell as Anna. All the songs are pretty catchy but there is one song that stood out from the rest and that is "Let It Go" performed by Ideina Menzel as Elsa. "Let I Go" is my favourite song out of them all. I started listening to this song on repeat even before I got the soundtrack on Disney's "For Your Consideration" site. I'm obsessed with this song! It has such an epic feel and gives me goosebumps! It's even more amazing when watching the scene in the movie where this song is in. After years of hiding her powers, Elsa can finally can "let it go" and be truly herself - and it's a beautiful transformation. Listen to the song! And go watch the movie! It is well worth the price of admission! 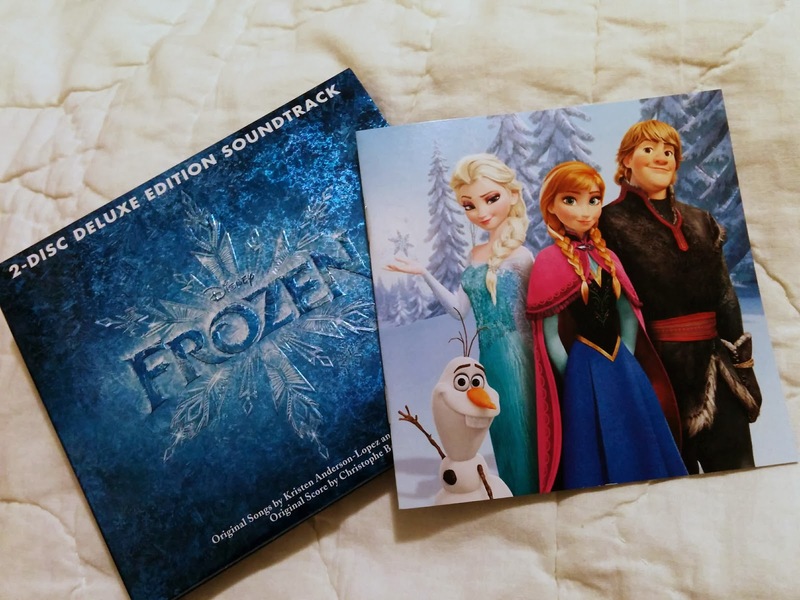 Frozen is currently playing in theatres and soundtrack is available on Amazon.ca as well as on iTunes. Currently the single CD is going for $18.06 while the deluxe edition is going for $21.33. Though the prices seemed to be in flux over the past few days (I bought it for $15.62). Is it worth paying a few more bucks for the additional songs on the second disc? Hmm. YES. Some of the outtakes are pretty catchy even though they don't fit into the story anymore. The composers also give an explanation on why they were cut prior to the song. Plus you get the instrumental only version of "Let It Go" so you can sing karaoke to over and over and over again (like me!). Or you can just download the album from iTunes. It's only 11.99 for the single CD and $19.99 for the deluxe version.